Is the Lucky Craft Real Skin �really� good? Introduction: Released at this year�s ICAST show the Lucky Craft Real Skin Pointer is now becoming more available in retail and e-tail stores nationwide. 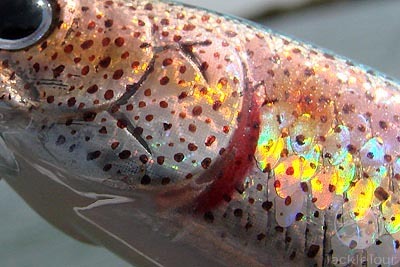 What makes the Real Skin unique is the application of actual natural skin in the lure�s construction. While novel, the question remains�. is the bait �really� any better than the original? Impressions: When we first saw the Lucky Craft Real Skin at ICAST we absolutely loved the concept. 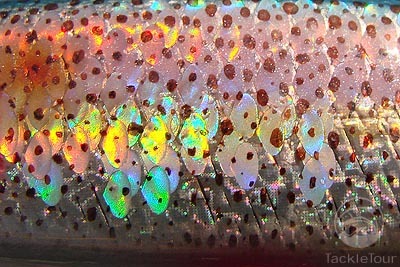 The company was looking for a way to make their already realistic lures appear even more authentic to fish, and had tried multiple times to add actual fish skin to the surface of their lures. Unfortunately this proved more difficult than originally contemplated, and scores of early prototypes failed. It was only after the heads of the company went for some sushi did they make a breakthrough. During lunch they saw the Sushi chef discard something from his cutting board, and when asked he remarked that it was simply the leftover skin. They headed back to the labs and found that the finely cut skin actually suited their application. In most lures Lucky Craft is now using squid skin, and all of these skins are actually procured through a number of sushi bars. The skin is laid over the LC traditional bait, and wrapped tightly, clipped off to dry, then dipped into gloss. 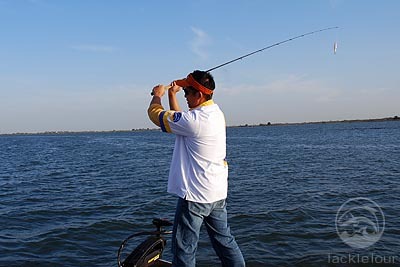 The lures are produced in four variants, Squid, Black Sea Bream, Halfbeak, and Cod. The latter three exhibit scales while the squid pattern is spotted. 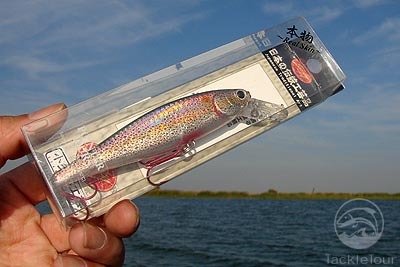 Lucky Craft went on to explain that the lures have not only increased realism but have the added benefit of actually putting out some scent. When the gloss breaks down through normal use and scratches pierce the lure�s surface the skin will put out minute amounts of scent similar to a real fish. Lucky Craft didn�t create a new styled lure to implement the �Real Skin� instead they turned to some of their proven performers to wrap including the Pointer, Slender Pointer MR, and Staysee. Real World Test: Like many other anglers the Lucky Craft Pointer and Staysee have gained our respect, and continue to be a staple in both our tests and personal tackle collections. 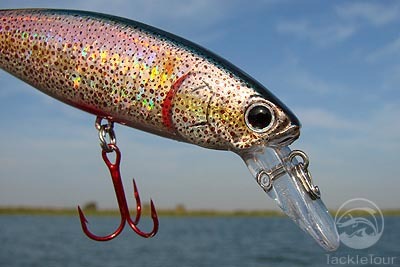 The lures have received glowing reviews, so rather than focus on the actual performance of these new variants we looked to see if the Real Skin added increased firepower to an already winning solution. We logged five trips targeting both largemouth bass and stripers to see cast for cast if the Real Skin variation of the Pointer increased the effectiveness of the lure. 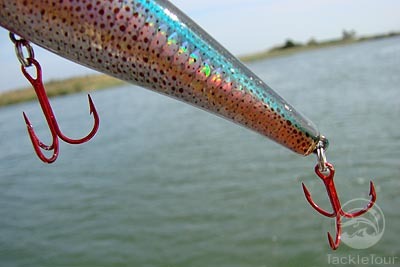 Casting: The Pointer is one the best casting rip baits out there, and the lure arguably upped the standard for all other ripping lures. The Pointer is above all things, reliable. I�ve only two baits out of countless lures ever not run true out of the box, and when it comes to casting the Pointer goes the distance. Making use of internal brass weights the lure casts exceptionally well. These same brass weights improve the lure�s unique ripping action on the retrieve. When it comes to ease of use and casting distance the Real Skin is no different than the original and that is a very good thing. Retrieve: Currently only the quid models are readily available, and were the only ones that we found on e-tail stores in the US. I have to admit the first time I saw the variation the first thing I thought was a Pointer with a serious case of the measles. 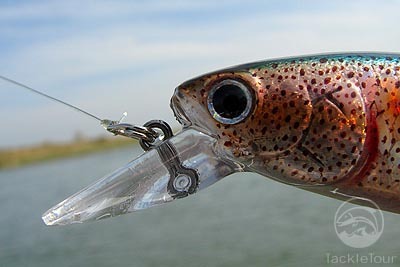 The squid Real Skin adds a red spotted pattern throughout the lure. The original version of the Pointer is already available in a slew of colors and patterns, but nothing quite like this. To be fair the lure does look better in the water. In our tests we cast side by side to the same spots time after time with one editor wielding the identical pattern without the Real Skin, and the other tossing the new variation. 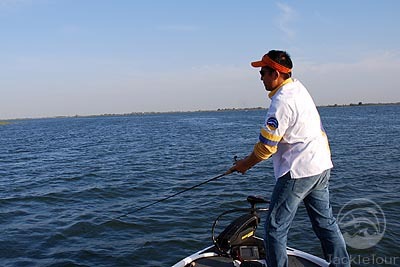 After two trips to the California Delta and over five hundred casts between the two versions the early results indicated that the Real Skin seemed to have little effect on both our strike and catch ratio when targeting either largemouth or striped bass. It seemed the action of the lure was what was inciting most strikes, and the strike count was almost identical.